I live in a neighborhood with a multitude of independent groceries catering to specific ethnic groups. This means I usually make multiple trips to individual stores to get what I need, sometimes every day. Luckily for me, that's my kind of fun. It also means I have little reason to ever darken the doors of a Jewel or Dominick's, which few people realize are direct portals to the inferno. Lately, though, I've been doing just that in pursuit of Blue Diamond brand Bold Wasabi & Soy Sauce almonds. Blue Diamond, "the world's largest tree nut processing and marketing company," introduced its "BOLD" line of flavors in 2005, which the company claims "appeals to [the] fastest-growing consumer groups in America: young men, Asians and Hispanics." So maybe that's why I missed them. But I caught up with some of the flavors in the last few weeks. To describe the "Habanero BBQ" expression as "bold" is an insult to that noble chile. The "Lime 'n Chili" flavor has a nice sour note, but again, relatively little heat. The wasabi-seasoned nuts, however, actually approach the nasal-scouring rush of a spicy tuna roll, with a nice salty balance provided by the soy sauce listed in the product ingredients. It's no wasabi pea, but I like where they're going. Of course, they're not made with real wasabi. Like most sushi restaurants, Blue Diamond is using horseradish. That's OK—you get what you pay for. 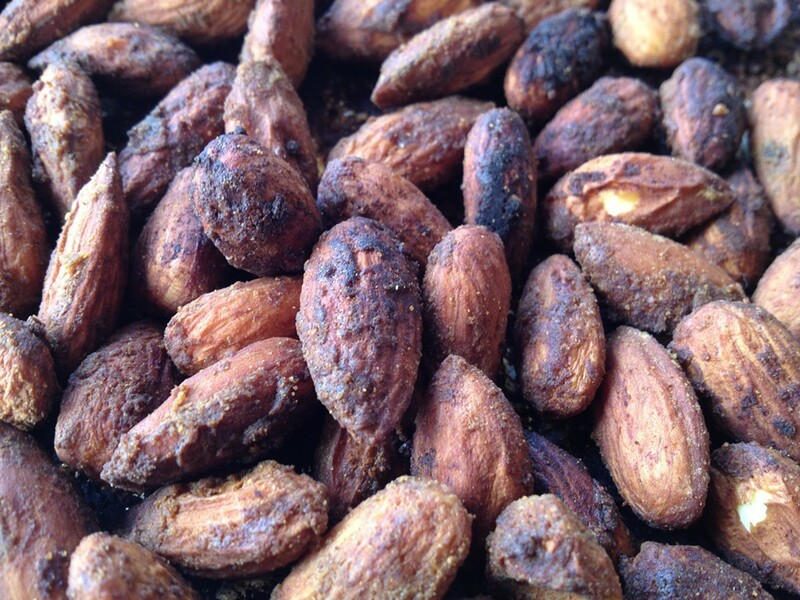 But BDBW&SS almonds do list a bunch of ominous-sounding crap on the ingredients list. "Fractionated coconut oil," for instance. And then there's the ambiguous "spice" and "natural flavor," terms that are marketing euphemisms for MSG, its existence also tipped off by the presence of disodium inosinate and disodium guanylate, two flavor enhancers usually used in conjunction with MSG. Aside from the fact that the former is trouble for asthmatics and babies under 12, according to Wikipedia (welcome back), I generally have no problem with appropriate levels of MSG in certain things. But I don't cotton to murky, manipulative labeling. That's reason alone to attempt to reproduce these in the kitchen. Plus, they're expensive: $4.29 at the Jewels for a six-ounce can; $3.99 at Walgreens, which has its own proprietary "Nice" brand of relatively insipid wasabi nuts. 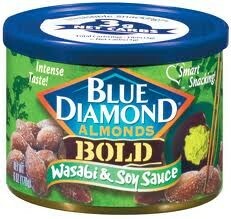 Oddly, Blue Diamond provides a recipe for wasabi almonds, which appears to be the same one found all over the web, likely propagated by the California Almond Board. Paula Deen-style wasabi-soy nuts. Don't try this at home. It's pretty simple, calling for plain almonds, water, egg white, salt, corn starch, and wasabi powder, which is again, really just horseradish, available in little green cans at your better Asian groceries. You season the nuts and bake them in a low oven for 50 minutes. They aren't bad. But they aren't bold. The wasabi powder has no power, and it's missing some of the rounded flavor that the soy and a wee bit of sugar might contribute. This recipe, which uses real soy sauce and butter, looked promising. But they get blasted in a hot oven, and you'd be correct in guessing they stay soft and burn. And again: little wasabi power. I thought I might be able to make it work if I could somehow powderize soy sauce—Kikkoman makes dehydrated soy sauce, but apparently only sells it in industrial quantities. I asked Phillip Foss if he could create dehydrated soy, and though at first he seemed doubtful, not atypically, he agreed to take up the challenge. If he pulls it off I'll spring for marconas and real wasabi root and we'll see what happens. Until then, I'm still a slave to Big Nuts. Hey-o! Mr. Meatyballs has nothing on me.